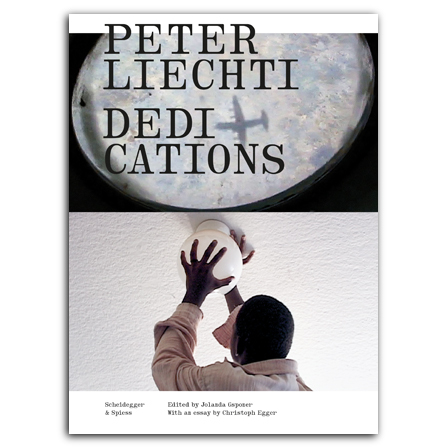 Peter Liechti (1951–2014) was a Swiss filmmaker, director, and cinematogra­pher. When he died after a long illness in 2014, he left behind a body of work comprising more than twenty mov­ies, many of which have been shown at film festivals worldwide. Dedications was his last project, started when he was already suffering from terminal illness and never finished. Although Liechti’s original idea with Dedications was a trilogy dedicated to Vincent van Gogh, the Swiss writer Robert Walser, and the unknown “Su­danese Chief,” the rapid progress of his illness caused him to revise this idea. Instead, Dedications became a dense personal project rooted in the filmmak­er’s current state. Although Liechti died in 2014 be­fore he could complete Dedications, his companion and working partner Jo­landa Gsponer has assembled the work here in three parts in keeping with his wishes. Part one is a recorded reading by the filmmaker from the diary he kept during his hospital stays. In part two, Gsponer and Liechti’s former col­laborators present the raw materials for Dedications in an audiovisual instal­lation. Part three is the book, offering the full text of Liechti’s diary and illus­trated with one hundred film stills and a DVD featuring the film’s unedited opening. Together, the book and DVD pay tribute to this filmmaker whose contribution to European film culture is of immense value. has for many years been film editor with Neue Zürcher Zeitung. He also lectured on film criticism and journalism. has been a consultant for experimental and film music and Peter Liechtis' production collaborator since 2003, and continues Liechti Film Production. Previously she owned her own shop for new and experimental music and worked at Zurich University of the Arts' Institute for Computer Music and Sound Technology. (1951–2014) was a Swiss film author and director, and producer. Born in St. Gallen, he graduated from Zürich’s School of Art and Design and taught drawing at a grammar school. 1981–82 he lived on Crete, working as an artist and writer. Following first experiments in film in 1983, he worked as a freelance film-maker from 1986.